FULTON, NY – The Fulton YMCA hosted a recent event dedicated to women’s health. Put on by Oswego County Opportunities and by Oswego Hospital, the fair focused on educating locals about where they can get free screenings and free educational services concerning cancer and other problems such as STDs and osteoporosis. Carolyn Handville, one of the organizers of the fair, said that the event was designed to reach out to the uninsured in the county. 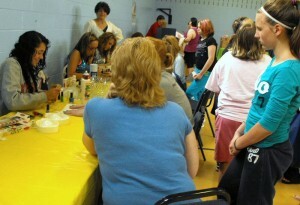 Ladies line up for free manicures at the health fair hosted by the OCO and Oswego Health. “We screen 300 or 400 people a year (through OCO services), but according to the state, we’re only reaching about 10 percent of eligible people,” Handville said. The fair had a mixture of health vendors and “pampering to draw the crowds,” according to Handville. In this manner, booths such as Avon and BeautiControl appeared next to the Tobacco Free Network of Oswego County and Dr. Casey McCaffrey’s Chiropractics booth. The fair was the third organized by Handville in the last two years. “She’s very organized,” noted Roxanne Seber, a vendor marketing to older women with Young Living Essential Oils. She also said that because the purpose is to reach the people who fall through the cracks in the current program, the fair will be in different locations throughout the county each year. This focus on coming to people and making health and health education more available to the residents of Oswego County was a common thread among many of the vendors. Toni McEniry from ARISE in Oswego, said that ARISE is dedicated to ensuring “fair treatment as far as all aspects of people’s lives,” and to promoting breast cancer education. Tammy DeRonde gets a relaxing massage from a representative from Integrative Healing Health Spa in Oswego, after learning about her posture from chiropractor Casey McCaffrey, also of Oswego. ARISE is an Independent Living Center: a non-profit, community-based organization run by and for people who have disabilities. A majority of its staff and board of directors are persons with disabilities. Each year, ARISE works with more than 4,000 people of all ages who have all types of disabilities, including physical, mental and emotional, cognitive, and sensory disabilities, as well as people who have multiple disabilities. ARISE has offices in Onondaga, Oswego and Madison counties and operates ARISE at the Farm, a 76-acre recreational facility in Chittenango. 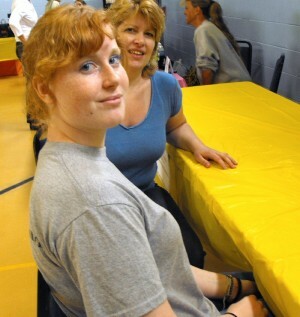 By coming to the health fair, McEniry hoped to “reach people with barriers” such as living far from ARISE’s Oswego facility in a rural area and having disabilities that prohibit transportation. Megan Irland, a health educator with OCO, echoed McEniry’s concern. “We want women to know that we exist, and that it can be free. We’re trying to remove barriers,” Irland said. She added that services offered such as birth control and health education are brought into people’s homes when they can not get out. Various vendors were present to address many problems for women of all ages and all walks of life, from sexual health issues to posture problems (conveniently set up next to a masseuse) to natural remedies for common problems like arthritis and the risk of cancer. Information about free cancer screenings and representatives from the Radiology department of Oswego Health were also readily available. The combination of the serious with the indulgences such as the masseuse set up in one corner contributed to making the fair a successful one, Handville noted. She said her goal was to hit 100 and the fair had more than 50 people in the first hour alone. Despite not reaching her goal, Handville considered the event as successful, because of the big ratio of uninsured people that attended. Several supportive husbands were in attendance as well, although the fair focused on women’s health. The crowd was mainly middle-aged women. The pampering, however, helped to reach out to women from younger age groups, creating a more diverse environment. Krystie and Emily Prevost, a mother and daughter from Fulton, also took advantage of the free manicures being offered. Krystie Prevost smiled as she explained that she seen the press release online. “Free is attractive,” she said. Emily (left) and Krystie Prevost rest after seeing the drastic effects smoking could have on them as they age. The pair also learned in a very direct way from the Tobacco Free Network booth, where program coordinator Abby Jenkins was showing people through computer software how they would look in 20 years if they smoked as opposed to if they did not smoke. There was plenty of information available about Child Health Plus and Family Health Plus, two health insurance options offered by New York State for families with low income, that Sharon Morgan took full advantage of. Morgan, who lives in Fulton, came to the fair to find out how she could get health insurance. “I’m unemployed and my previous job didn’t offer insurance,” she explained. Another attendee from Fulton, a middle-aged woman named Cora, came because she saw a write-up on the fair on Oswego County Today. “I’m interested in my health,” she said. osteoporosis and osteopenia, which is a condition generally considered a forerunner of osteoporosis. Kevin Kain, who was running the tests, also had information on how to counteract low calcium in order to reduce one’s risk for bone problems.